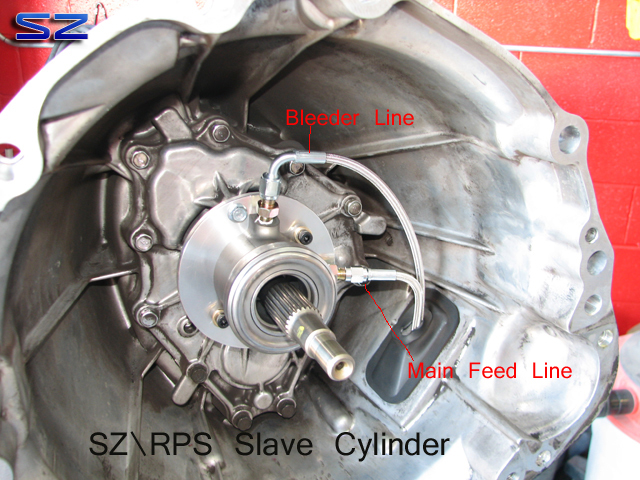 Thank you for purchasing a SZ\RPS Clutch & Flywheel Kit for your HR\VHR vehicle. Installers! Please read the entire literature prior to installing this kit! The proper installation is CRITCAL to how this kit works. The details CANNOT be overlooked! Any or all installation errors are not covered under warranty. Please pay attention closely! This kit includes the flywheel, clutch disc, pressure plate, pilot bearing, alignment tool, throw-out bearing and internal slave (CSC) along with the necessary hardware and lines to make it all work. Our kits are sold together and cannot be used separately with other clutch components from the OE manufacturer or any other aftermarket company. We use modified heights on the assembly to ensure the maximum release and life of the clutch disc in conjunction with our upgraded internal slave and throw-out bearing assembly (CSC). Check to make sure the adapter plate sits flat against the transmission cover and that the ridge on the cover fits in between the machined groove on the bearing plate. Torque the 10mm head bolts snugly using Blue Loctite. You will notice that the assembly NEEDS to be installed with the bleeder hose and fitting pointed UP towards the TOP of the bell housing (90 degree hose). This allows for air in the system to properly bleed out. Otherwise if the bleeder is installed incorrectly you will never get the air out properly! The hoses and fittings are AN based and DO NOT require any additional Teflon tape or silicone to seal. Doing so can make matters worse. The bleeder hose and fitting will simply stick out of the factory rubber boot cover. Zip tie it to the main feed line to keep it from moving around. The fitting at the end of the bleeder hose will allow one to bleed the system with help from someone else. It is tough to get all the air out of the system and at times the master may bypass the fluid. If this occurs, open the bleeder on the hose and let it gravity feed for a period of around 10 to 20 minutes. After this you can close the bleeder and begin the standard bleeding procedure. Remember to be patient and allow the pedal to come to its full stroke upon engaging and disengaging. Once all the air is properly bleed off you should have a nice firm yet “light” pedal. You can verify that the new slave and bearing are traveling (stroking) properly by pulling the factory dust boot cover (where the lines go through) and having someone engage and disengage the clutch pedal. One should see the bearing push down on the diaphragm of the pressure plate. You will do all this of course once the entire assembly, transmission, and main feed line are installed. Bleeding & checking will be the last thing before driving the car. It is HIGHLY recommended to use a high quality DOT4 brake fluid. The main feed line will come off with the straight hose and approach out towards the main factory hard line located on the chassis. The rest of the factory hard lines used on the factory CSC will NOT be reused. The lines will hang out from the factory dust cover until the transmission is bolted to the engine and one can attach the main feed line to the factory hard line. Be sure to remove the old pilot bearing (located in and at the back of the crankshaft) and replace with the included bearing. Use a high quality grease like Mobil 1 Synthetic or Royal Purple SynGrease on the bearing (inside where the input shaft of the transmission would go). You can also use a high quality anti-seize compound like Lubro Moly 508 as well (instead of the synthetic greases). I stress the high quality aspect because of the temperatures seen. Regular greases and compounds can dry up quickly. Apply some to the end of the input shaft on the transmission as well. Lightly coat it as you DO NOT want any of the grease or compound to get onto the clutch surfaces!!!!!! The throwout bearing is part of the internal slave assembly (CSC). The factory flywheel bolts will be reused. The flywheel will have a hole to line itself up with the crankshaft dowel. Not installing the flywheel to the dowel will cause damage to the dowel and flywheel along with having a vehicle not starting up properly. Use a dab of Red Loctite on the flywheel bolt threads and torque them down to 80-90 ft\lbs. Use a dab of Blue Loctite on the pressure to flywheel bolts and torque to 28-32 ft\lbs. Be sure to use the clutch alignment tool provided in the kit to make sure the disc lines up properly otherwise you will have one hell of a time installing the transmission and you will end up damaging the clutch disc and possibly the pilot bearing! The units are balanced together (pressure plate and flywheel) to ensure an even smoother operation. You will notice machining paint to help you reinstall the assembly as it was balanced. Be sure to pay attention to this! Slowly tighten each pressure plate bolt in a star pattern and be sure to not tighten each bolt entirely until all the rest are tightened equally. You will essentially go around at least 2-3 times before performing the final torque spec. Once it is all torqued down, the alignment tool should EASILY slide in and out of the pilot bearing and clutch disc. If it does not you will need to loosen up the pressure plate bolts, re-align the disc, and ensure that the alignment tool slides easily in and out. The transmission if properly aligned (along with the clutch disc) should stab right into the engine smoothly. If the weight of the transmission is rested onto the clutch disc it can screw up your perfect clutch alignment and require it to be re-aligned. Forcing it in will cause big issues and break parts! Lastly the clutch pedal rod and switch may need to be adjusted. If the engagement is close to the floor and\or hard to get in gear the rod and switch need to be adjusted. This is done by loosening the lock nut on the rod and turning the rod clock wise (tightening the rod towards the firewall). By doing this the switch that the clutch pedal rests on needs to be backed out away from the pedal. This will ensure you have free play in the system and keep the clutch from slipping. If you have ANY questions or are unsure in your abilities to install this kit properly please give us a call @ 818.703.6272. Seb!! Hey brother print off this blog in your instructions! All of these are great tips for everyone especially the backyard mechanic! Haha!